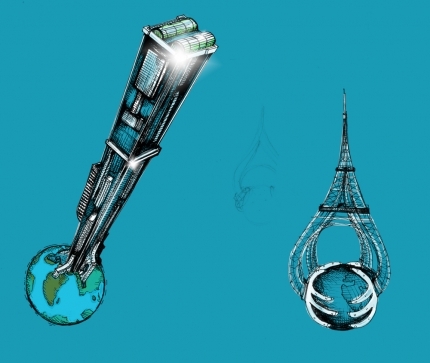 Instead of having a spaceship, how about to visualise your idea of the Bable tower by having one very, very big building? Each country could be a floor, a city would be a room. Leo brought me to this thought. If we choose a tower or giant building as the setting of our storys we must avoid to mention the Bable tower/story in the comic... otherwise this basic idea becomes to obvious and pale. But seeing this tower and the earth, aha, like what PieR mentioned about not making it too obvious, maybe we draw earth as having a horizontal shape. So it's kinda intriguing, like "what happened?!" And we show it as a whole object,like the planet itslef became shaped like a rectagular box. but the truth is that it's a very big tower with lots of rooms. We can also play with gravity because the earth is not round anymore! also the planet will look like a spaceship but it's actually not. also we can play with the moon!! attach it with the tower, or keep it revolving and rotating in a wierd manner.